The Mamiya 6MF is an electronically controlled 6x6cm rangefinder camera. The modern, yet classic 2-1/4" square rangefinder camera has three interchangeable, exceptionally high performance lenses. It has built-in manual or A/E auto metering, unique multi-format capability, and silent, fast and lightweight, hand holdable design. Also shoot 24x54mm panoramic images. Light, compact, good ergonomics apart from lens changing. Quiet. Extraordinary battery life. Lens changing takes practice. Cannot do head and shoulder portraiture as close as you would like, though you can crop. Cannot focus very close. Cycletouring is what I and my wife do on holidays. I've been on about 45 tours. The Mamiya 6 is THE best all round travel camera in that the lenses are stunning, it's a light system and compact and the body and 3 lenses will fit in a handlebar bag camera case (made by Agu). Lens changing is a bit tricky but you get the hang of it. The meter is best used in its simple to use lock mode. Focussing is not a problem, and I find little difficulty with the 150mm. People who do may need glasses. The build quality is very good and the battery life is extraordinary in my experience. I've used different kit in my years of bike touring, but the really great shots technically have been with this. It just blows any digital camera out of the water. I now use print film of any type and scan it on a Nikon 8000ed with glass film holder (essential for easy scanning). Mamiya rb67. Fuji GA670iii. Kiev 88. Yashica 124g. Fantastic travel camera for all the above reasons. Forget 35mm cameras unless you are doing sports or long distance nature photography, as you won't get the quality of results that you get with this baby. Read the other reviews as they cover the strengths very well. Having used the cameras below, this Mamiya is a great all purpose camera; there are other cameras that will do certain jobs much better but you will require more kit to achieve a better result. As mentioned elsewhere, sub 3ft photograhy is impossible unless you get a close up lens attachemnt (only fits the 75mm lens and only operates between 12 and 18 inches, I believe). I would love to be able to head shot portraits but, alas, it is not possible. The most difficult lens to use is the 150mm as there is no magnification of the image to compensate for the increased distance of the subject; the minimum focus distance is 7 (yes, 7) FEET. But it is a cheap lens and well worth the money. The 50mm lens is expensive (around £500 secondhand) and it is very good. I would not want to be without it, but in terms of results and the value for money the 75 mm lens is astonishgly good. Mamiya 6: £1500 in total for body & 3 lenses second hand. The results from the camera and all the lenses have been superb. It is a great travel camera, dead reliable, fits my hand beautifully, robust, fairly versatile, quiet, reasonably unobtusive and easy to use. My favourite lenses are the 50mm and 75mm as they are pin sharp; if you had the choice of one all purpose lens I would take the 75mm as the results are so crisp and it is very cheap. Focussing is dead easy. The 150mm is more difficult to get good results from because of the small focussing area relative to the distance of the subject. The best results seem to be around F8 and F11 in terms of sharpness edge to edge for all the lenses but the fall off at smaller and larger apertures is not particularly noticeable. You do find that the amount of detail that is reproduced is amazing. I find that lens filters degrade the results substantially so I don't bother wit them now. Metering is so good that I don't bother with a hand held light meter but I do use mainly colour negative film (Fuji Superia 100, Fuji Reala 100, Fuji NPS and NPC 160) and it tends to have more exposure latitude than transparency films. I do use Fuji Velvia 50 with astounding results, but I find that a hand held meter does improve the results; either that or expose at 32ASA. I tend to find that the Kodak & Agfa films colour negative films don't give the same clarity of result (seems grainy and could down to the user) but Kodak 400VC does give some pleasing images, particularly on older people. I use Ilford for black & white. For flash, I use a Sunpack 3800 but now wish I had bought a more powerful Metz; the synch works at all speeds but I tend to use 1/30th or 1/60th unless it is for a fill in flash. Buy a Mamiya 6 and you will never regret it; it will be a classic like a Leica M series. I am keeping mine forever! Never used it but I am told that each lens should be fitted by Mamiya to a spcific body to get the best results; to date I have not bothered as I don't want another 2 bodies. Servicing doesn't seem too expensive, but to date it has not been required. As this is one of the cameras I reviewed in print for the old _Camera & Darkroom_ magazine, I just wanted to mention that despite the scuttlebutt, there isn't a thing wrong with the Mamiya 6 meter. You just have to remember that it's a reflected light meter that gathers light from a window on the front of the top plate. Direct sunlight striking that area may throw the readings off. Simply shade that area with your hand. Your readings will be more than accurate enough for negative films, certainly (it's actually quite an excellent meter). Want to do this more or less automatically? Simply wear a cap or a hat. It protects the meter from sunlight when you have the camera up to your eye in 9 out of 10 situations. Many, many. Too many. www.37thframe.com. Awesome lenses. Fantastic collapsibility. Easy to focus (without focus adaptors etc). 150mm can be tricky to focus depending on lighting conditions. Very rugged design and no bigger than an old F4 Nikon SLR. 150mm lens can be difficult to focus depending on lighting. Not a portrait camera system (no real macro), but you can still do great portraitures. Shooting Infrared (HIE, one does get the reflection of the film backplane (especially the knob showing 120:220 rotation). This is a fine camera with the 3 lenses for those who want flexibility and travel-ability. I have two M6 bodies with the 3 lenses and love their operation. Sure the RF design doesn't allow for true portrait-sized photos, but one can still shoot portraits very well (not as good as a macro from a Hass). The 50mm and 75mm lenses are awesome and the 150mm is also a fine lens (but not used so much). The collapsible mount allows great storing for road-trips especially if you are going to lug it around for days on end in the bush. I am not so perturbed by the slowness of the lens. For the f3.5, f4 and f4.5 of the lens series, these are all fine with selection of subject and film speeds. Batteries (lithium) last along time too. Let me see... Long distance focusing! This is the world's most perfect camera system. 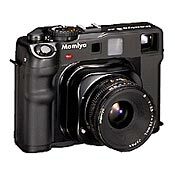 It is better than the current Mamiya 7 system in terms of convenience, which is the whole point of these cameras.All three lenses collapse about 1.5" into the camera body, making a very compact camera. Heck, it weighs less and gets smaller than my Nikon. The Mamiya 7 cannot do this, and this is very, very important to me. This makes my medium format Mamiya more compact to carry than any of my Nikon SLRs.All three lenses are spectacular. The 50mm lens is one of the most perfect lenses I have ever used. It tests much better than the Zeiss Distagon for the Rolleiflex and the same as the Zeiss lens on the Hasselblad.The fact that these are rangefinder lenses and can be designed without having to work around the rear lens extension interfering with an SLR mirror allows the Mamiya 6's lenses to outdo the SLR systems. All three lenses have their own electronic leaf shutters providing speeds from 4 seconds to 1/500 and Bulb. Manual shutter control is at full stops while automatic control is stepless. Apertures of course may be set anywhere and the meter reads this, too. Electronic shutter control gives perfect accuracy at slower speeds and is limited only by shutter efficiency issues at the very top speeds. The shutters never require calibration. They are far more accurate than any mechanical shutter as on most Leica, Hasselblad and large format cameras. Flash sync on all lenses is at all speeds including 1/500, which is twice the speed of any Canon, Nikon or Leica. Focusing distance- I have both the 75mm and 150mm lenses, and have routinely been disapointed by the 1m and 1.5m range of each lens respectively. But, I would consider using that hideous close up attachment. While the lenses aren't as wide as they should be, they perform wonderfully. Interestingly enough, my 'classic' rolleiflex also only focuses at 1m (without an attachment) and only has one lens... hmm function is in the eye of the beholder. I have found that even despite the inherent downsides in using a range finder, the overall setup is one I plan to keep my hands on. I am currently a photography student, originally the Mamiya 6 was my introduction to medium format. In the beginning i was interested mostly with the size and portability of the camera. I was delighted with the fact that it was no bigger than the SLR I had been using. The camera has ended up being amazing to use. The various locking mechanisms do their job to protect you from yourself, and the overall feel is very solid and satisfying. Once I was accustomed to the feel of the camera, the operation became very quick. Also, if you take the meters suggestions witha grain of salt- the desired results are achieved. none needed, although i checked it out before i bought the thing online incase it needed servicing. In defense of the build quality though, i never needed any. Mamiya 6 (not MF) Rolleiflex 2.8 other msc. cameras. Light, small, excellent resolution power, square it is easier to compose, precise meter also. I bought this camera for my fine art photography, I do advertising to live but I was looking a good camera for traveling and taking pictures, my first choice was a Leica 7 but the Mamiya 6 with the big film size convice me, I travel to Las Vegas and shoot 10 Provias 100, amaze me looks like I was using a polarizer, incredible contrast and resolution power. The camera and the three lenses are very easy to operate, the meter is centerweight so it is very precise. Simple system with very good optics especially 50mm. Ease to carry, light and compact. Almost shockless and silent. If you want to take Macro and/or portrait you must buy SLR. (Generally, rangefinder is not suitable for these without high technique.) If you want to get universal camera you must buy 35mm SLR or 645 SLR is good as a good compromise. I'm using the camera as a snapshot and landscape. Basically I think there are no universal medium format camera. Actually, I have Bronica SQ-A for portrait, Macro and telephoto. But SQ-A is too havy, too much shutter shock. It require a heavy rigid tripod. Then, it is not ease to carry. Not good for snap photo. Some shooting point do not allow us to use a tripod and must be approached by foot. Then, heavy system is not good for me. As a snap shooter, the camera is good. Also as a landscape camera, it is very good. Especially landscape midium format is much better than 35mm. Some said brighter lens is necessary. I do not agree. As a midium format camera, I think brighter lens cannot be controlled focus enough. Brighter lens is too thin focal depth to use with rangefinder. This type opinion is come from bigineer of rangefinder camera. If you know your taste, and the camera fits your taste, then you love the camera. I got overhaul. Good enough. It's a very light compact camera that can be taken anywhere. Optically the lenses give great results. The view finder is clear and bright. The 28mm is a great lens. Held its value well, I sold it for $3 (not much but better than a loss) more than I paid after almost a year of use. The lenses are very limiting. The 75mm should have, and could have, been a 2.8. Sure you can hand hold a rangefinder at a slower speed than an SLR, but then again most MF SLR's have 2.8 standard lenses so much of the rangefinder's theoretical hand hold advantage is lost. The 150mm is hard to focus, which is a fact of life with a rangefinder. More importantly, the minimum focus distance is 1.9M! Half the reason for getting a 150mm is for use as a portrait lens and you can't get a head shot with this lens. The 28mm is a beauty, but a system should really have more than one good lens. The meter in my earlier model was pretty worthless. Since a hand held meter is required for most situations, they should have left it out and dropped the price. No macro, hard to use telephoto (true of almost any rangefinder). Cost-If I had unlimited cash, I would have held on to it but it's too expensive to sit in the closet most of the time. A very handy camera for a lot of situations, but too many restrictions. Bronica S2a, Leica IIIC, Leice M3.